Production: New Era Studios for the Empire Marketing Board; black and white, 35mm; running time: about 40 minutes. Released 10 November 1929, premiered at the London Film Society. Filmed 1929 in a small fishing village in Northern England, and on board a herring boat at sea. Cost: Grierson declares cost to have been about £2500, while Rotha remembers it as being less than £2000. Produced, scripted, directed, and edited by John Grierson; photographed by John Grierson and Basil Emmott. Grierson, John, Grierson on Documentary , edited by Forsyth Hardy, London, 1966. Jacobs, Lewis, editor, The Documentary Tradition: From Nanook to Woodstock , New York, 1971. Sussex, Elizabeth, The Rise and Fall of the British Documentary: The Story of the Film Movement Founded by John Grierson , Berkeley, 1975. Barsam, Richard, Nonfiction Film: Theory and Criticism , New York, 1976. Beveridge, James, John Grierson, Film Master , New York, 1978. Hardy, Forsyth, John Grierson: A Documentary Biography , London, 1979. Ellis, Jack C., John Grierson: A Guide to References and Resources , Boston, 1986. Close Up (London), November 1929. Bioscope (London), 27 November 1929. Grierson, John, "E.M.B. Film Unit," in Cinema Quarterly (London), Summer 1933. Blumer, Ronald, "I Derive My Authority from Moses," in Take One (Montreal), no. 9, 1970. Sussex, Elizabeth, "John Grierson," in Sight and Sound (London), Spring 1972. Sight and Sound (London), Summer 1972. "Grierson's Hammer," in Films and Filming (London), July 1972. Sussex, Elizabeth, "Grierson on Documentary: Last Interview," in Film Quarterly (Berkeley), Fall 1972. Forsyth, Scott, "The Failures of Nationalism and Documentary: Grierson and Gouzenko," in Canadian Journal of Film Studies (Ottawa), vol. 1, no. 1, 1990. Bernstein, Matthew, "Film and Reform: John Grierson and the Documentary Film Movement," in Film Quarterly (Berkeley), vol. 47, no. 2, Winter 1993. Acland, Charles R., "National Dreams, International Encounters: The Formation of Canadian Film Culture in the 1930s," in Canadian Journal of Film Studies (Ottawa), Spring 1994. Journal of Film, Radio and Television (Abingdon), vol. 19, no. 3, August 1999. Drifters was John Grierson's first film, and the only one of thousands of films for which he was responsible that he completely controlled creatively. Not only did he write the script, produce, direct and edit, but, according to Forsyth Hardy in his biography of Grierson, he shot much of the film himself. In its editing he was assisted by Margaret Taylor, who became his wife. 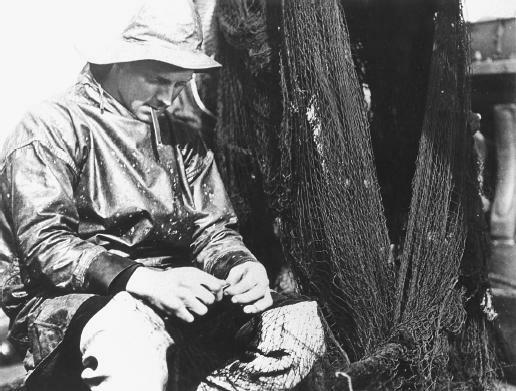 About the work of herring fishermen in the North Sea, Drifters has a simple narrative structure. The men board their ships in harbor, sail to the banks, lay the nets, haul in the catch in the midst of a storm, race homeward to the auction of the catch at quayside. It includes images of Scotland and the sea, both important in Grierson's life and recurring in the films he produced. Herring fishing was a canny choice since the Financial Secretary to the Treasury was an authority on the subject. Drifters marked the beginning of the British documentary film and served as a prototype for many of the films that followed. But, rather than evidence of an innovative genius, it represents the work of a brilliant analyst and synthesist who had absorbed what was at hand for the making of the kind of films he wanted to see made. In it are reflections of Flaherty's Nanook of the North , with brave men eking out their existence in the face of the elements. Eisenstein's Potemkin is even more heavily called upon. In Drifters the loving long takes of a Flaherty are cut up and banged together in Eisensteinian montage to provide a modern energy and rhythm, and the individual accomplishments of Nanook are replaced by the collective efforts of a crew, as in Potemkin. It is unlike both models, however, in eschewing the exotics of Flaherty and the heroics of the Soviets. In Drifters the drama is in the everyday workaday. By ending on the fish being sold at market, Grierson sets the fishermen's work within the context of the economic actualities of contemporary Britain. Its premiere at the Film Society in London was as the first half of a double bill on which the British premiere of Potemkin was the main attraction, with Eisenstein in attendance. Though risking the comparison must have taken considerable nerve on Grierson's part, he knew that the audience for that event would comprise the intellectual elite and correspondents for the national press. Drifters was very well received and went on to modest commercial distribution. It was the first instance in English cinema in which work had been given this sort of importance and members of the working class were presented with dignity rather than as comic relief. As a silent film it was severely handicapped, however; at the time of its release the transition from silence to sound was becoming complete. Rather than continuing as a personal filmmaker, as he might have done, Grierson used the success of Drifters as the basis for establishing the Empire Marketing Board Film Unit, for hiring others who would make more films and develop the British documentary film movement.